How Egg Crate Foam is Made @whitehouse @mfgday #MFGDay16 « Adafruit Industries – Makers, hackers, artists, designers and engineers! 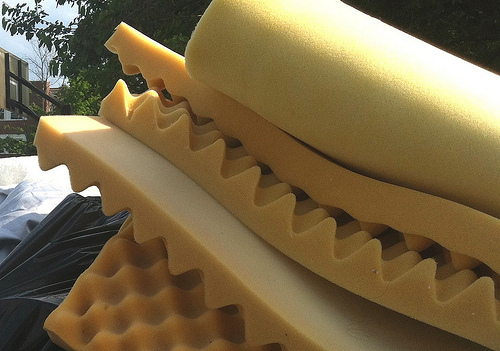 Ever wonder how they make foam rubber into an “egg crate” shape? You can tell that it isn’t molded that way, because there is not a smooth skin on the surfaces. And it clearly isn’t milled to that shape, since it comes in matched top and bottom pieces that are cut from the same initial block of foam. So how is it done? Amazingly enough, it’s done with a bandsaw.